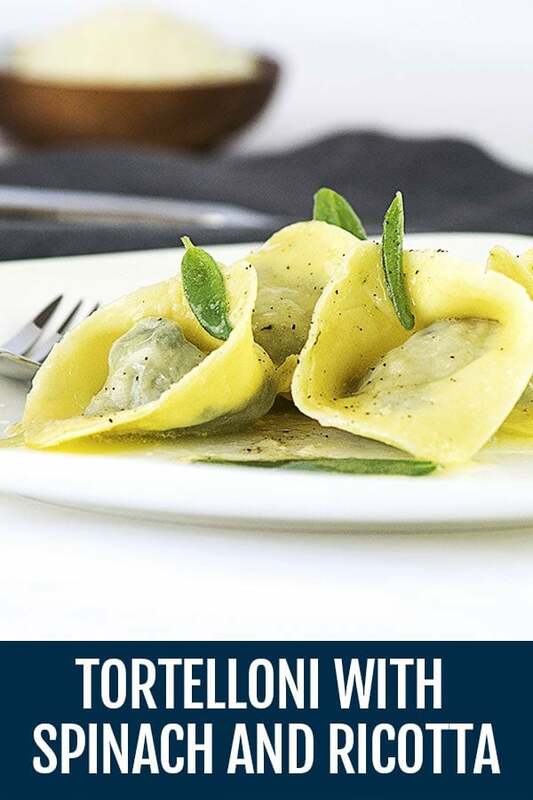 Tortelloni with Spinach and Ricotta Recipe | Delicious! This dish is one of the most iconic recipes from Bologna. I was feeling nostalgic and wanted to create a traditional meal from scratch, that took me back to my time in Bologna. I decided to make this popular dish following the exact recipe, so I made the pasta dough, rolled it with a pasta machine and hand made each little tortelloni filled with my spinach and ricotta mixture. 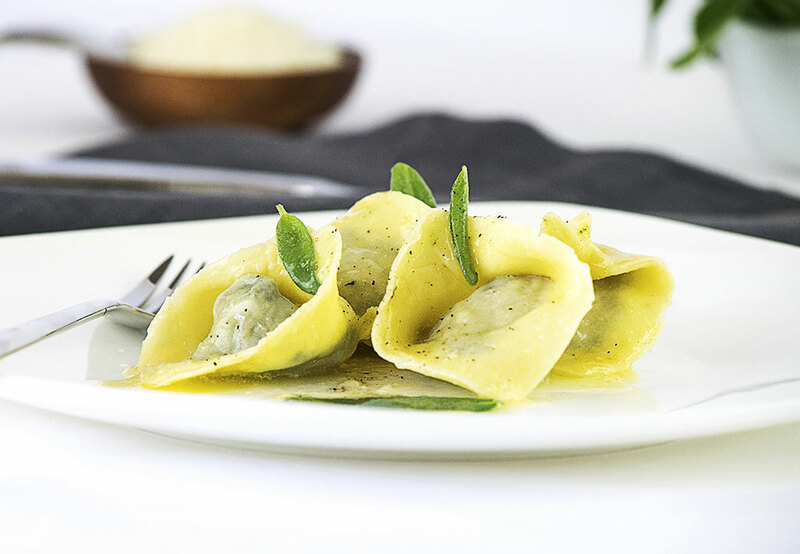 Your guests will notice the difference between homemade pasta and store bought, because of the time and care you put into hand making each delicious tortelloni. 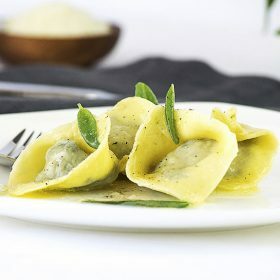 There are many types of filled pasta: ravioli, tortellini, cannelloni, but I love the shape of tortelloni. I paired it with a simple butter and sage sauce and voila…the perfect pasta dish was served and my guests were fulfilled and impressed. Thank you Bologna for inventing these delicious and simple recipes that continue to make people happy. Tortelloni are one of the delicacy of the Emilia-Romagna region. Homemade pasta tastes definitely better pared with a butter and sage sauce. Add the frozen spinach in a large skillet over medium-high heat, cover and cook for 5 minutes, transfer into a large sieve to drain while it cools. When cooled, squeeze all the excess water from the spinach. Put the spinach in a food processor along with the ricotta, Parmigiano-Reggiano, nutmeg, salt and pepper. Pulse until it becomes a creamy consistency. Transfer to a bowl and set aside. Add flour, eggs, and salt in the mixing bowl and attach the dough hook. Turn to speed 2 and knead for 5 minutes. Remove the dough and knead by hand for 2 minutes. Shape into an oval disc and let it rest for 30 minutes wrapped in plastic wrap. Cut the dough into a 1-inch piece and flatten into a rectangular shape, add a small amount of flour to both sides. Attach the pasta sheet roller to your stand mixer and set it to #1. Turn on the stand mixer to speed 2 and run the pasta dough through the roller. While on #1, fold the dough in half and run it through again. Do this twice. Adding a little bit of flour on each side of the dough again, change setting to #2 and pass the pasta dough through the sheet roller. Do this twice and then twice each on #3 and then once on #4 #5 #6. Once again, add flour to each side of your long pasta sheet and set on your working table. Let them rest for 3 minutes. Cut into squares with a 3-inch square cookie cutter. Put one heaping teaspoon of filling on each square, brush water all around the edges. Pick up the square and stretch the sides do not stretch the corner. Line up two opposite corners and pinch to seal to form a triangle. Take two of the opposite sides of the triangle and fold to the front and pinch together. In a large pot of boiling, salted water, add the pasta and cook for 3-4 minutes. In a medium saucepan melt the butter and sage and melt over medium heat for 4 minutes. Add cooked tortelloni and gently stir to coat. Serve immediately and garnish with some Parmigiano-Reggiano cheese, black pepper and some torn sage leaves.